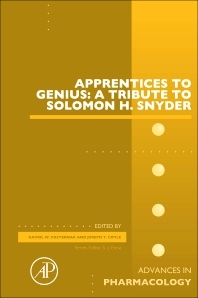 Apprentices to Genius: A tribute to Solomon H. Snyder, a volume in the Advances in Pharmacology series, presents a tribute to Dr. Solomon H. Snyder, highlighting chapters submitted from a broad range of his students. It covers many different areas of neuroscience and pharmacology, with this volume exploring how receptor binding and drug discovery, the emerging role of glutamate in the pathophysiology of mental illness, nitric oxide signaling in neurodegeneration and cell death, carboxypeptidase E and the identification of novel neuropeptides as potential therapeutic targets, the regulation of mitochondrial functions by TSPO, clozapine and its translational investigation, and more. Dr. Gavril Pasternak holds the Anne Burnett Tandy Chair in Neurology at Memorial Sloan-Kettering Cancer Center where he is an Attending Neurologist in Memorial Hospital and a Laboratory Head in the Molecular Pharmacology Program within the Sloan-Kettering Institute. After receiving his M.D. and Ph.D. degrees from the Johns Hopkins University he completed his clinical training in Neurology at Johns Hopkins Hospital and joined Memorial Sloan-Kettering in 1979. He is known for his work on opioid receptors, starting with the initial description of the ‘sodium effect’ and its modulation of agonist/antagonist conformations of the mu opioid receptor, a concept that has now been extended to all G-protein coupled receptors. He proposed the existence of multiple subpopulations of mu opioid receptors based chemical biological approaches and confirmed the hypothesis by isolating a vast array of splice variants of the mu opioid receptor gene. From these mu opioid receptor variants, he identified a subset that can be targeted to produce potent analgesics without many of the side-effects of current drugs. He has published over 400 articles and has served on the Editorial Boards of numerous scientific journals as well as the Board of Scientific Counselors of the National Institute on Drug Abuse. He is a Fellow of the American Academy of Neurology and of the American Neurological Association and a member of the Johns Hopkins Society of Scholars. He has received numerous awards, including the Millenium Prize from the Norwegian University of Science and Technology, the John J. Bonica Award from the Eastern Pain Association, the Julius Axelrod Award from the American Society of Pharmacology and Experimental Therapeutics, the S. Weir Mitchell Award from the American Academy of Neurology, the Louise and Allston Boyer Young Investigator Award from MSKCC and a MERIT Award from the National Institute on Drug Abuse. He has been honored with the 2014 William Potter Lecture at Thomas Jefferson University, the 6th Donald W. Benson Lectureship on Pain Medicine at the Johns Hopkins School of Medicine and the 1st Annual Machaskee Memorial Lectureship at the Cleveland Clinic. He lives in New York City with his children. In 1996 he co-founded the Bernard “Doc” Schoenbaum Youth Lacrosse League in New York City which has served thousands of boys and girls in grades 8 and below since its inception. In 2001 and again in 2010 he was honored as Man of the Year by the Metro Men’s Division Coaches Council of US Lacrosse.